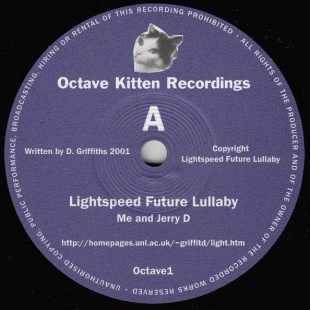 Incredibly limited single from Lightspeed Future Lullaby, preceding their debut album. The A-side is an upbeat tribute to you-know-who, definitely one for fans of Plaid, or the more melodic ventures of U-ziq. Flip to side 2 for a remix by My Life In Mono, aka Mike from PLONE (Warp), which is everything you\'d expect - melodic keys and fierce cut-up digi breaks; without doubt as good as any Plone release. Both tracks exclusive. Beach Boys, Kraftwerk and Ennio Morricone-inspired electronica is music to dream to.